7 common questions that kept business owners up at night – answered! If you’re a business owner who has lost sleep over any of the following questions, don’t worry. You’re not alone. 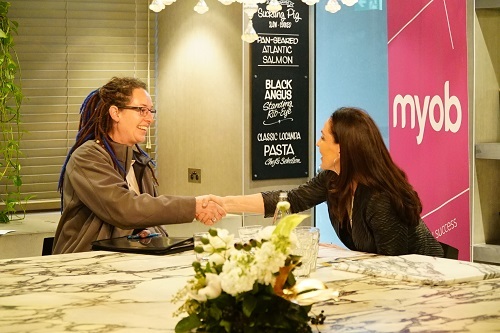 Recently, MYOB ran a competition to give small business owners the opportunity to ask Boost Juice founder, Shark Tank panelist and all-around dynamo Janine Allis all about her tips for managing a business. After picking our 13 finalists, we invited them to meet with Janine and pick her brain over lunch. While these business owners are from different places and work in different industries, their questions were variations on a theme, and go to the heart of concerns a lot of business owners have. Luckily, we have a few ideas about how to answer those perplexing questions. 1. How did you find the right people who share your passion? Hiring people for skills can be as easy as reading a resume, but hiring the right people is something else entirely. An ideal employee can not only carry out the duties of the job you’ve created, but has the passion to attack their tasks with vigour to go above and beyond their job description. Here’s how to find those people. 2. Would franchising work for my business? Franchising a business can be a way to expand your business and brand while playing with other people’s money. From the extensive documentation required, to the tweaking of your business model, it can take a lot of work to get your business franchise-ready. 3. How do we know whether the growth we’re experiencing is sustainable? It stands to reason that for any new business that the rate of growth they experience is unlike anything they’ll see in their business journey, because they’re literally starting from nothing. But there comes a time, early in a business’ journey, when they need to forecast growth out to make good business decisions and find themselves wondering whether their growth rates are sustainable. The real question then becomes: ‘How do I manage sustainable business growth?’. READ: I’m a small business getting big, how do I manage growth? 4. We’re an organisation that has changed quite a bit, how do we pitch to win new clients? One business owner had changed their business drastically and was starting to play in new industries. The problem is that what won business before isn’t going to win business now, so do you need to fundamentally change the way you’ve been pitching before to win new clients? The answer is that although some things will change on the periphery of your pitch, the fundamentals of pitching will remain the same – so maybe it’s time for a re-fresher. 5. How much rest should a busy entrepreneur allow on a daily basis? While we’re all taught to hustle and grind our way to business success, too many people think that we need to grind ourselves into the dirt to be ‘doing entrepreneurship the right way’. But, it doesn’t need to be like that. In fact, it shouldn’t be. If you’re not looking after your biggest business asset (you), then you’re doing you, your clients, and your staff a disservice. 6. How does a sole trader win their first few clients? The first few clients are the hardest ones on the books, because they’ve got to take the biggest leap of faith to use your services. But once they’re clients, your business will gain an air of legitimacy, beginning a virtuous circle of client winning. So, here’s how to bag those first clients. 7. How do you set up your business to deal with competition? Business would be easy if it weren’t for those pesky competitors! Competition is a fact of life unfortunately, but there are a few things you can do to make sure your business is in the best possible place it can be without risking disruption to your existing business. While we’d all love to get personalised feedback from Janine Allis on our businesses, she can’t be everywhere at once. But, luckily, we write about all sorts of things here on The Pulse, so take a look around. We’re sure you’ll find something to help you out.